Jacksonville, Fla. - June 23, 2014 - For the second year in a row, CSX has been named a "Best Place to Work in IT" by IDG's Computerworld. Ranked fifteenth among large companies, CSX improved its ranking from 2013 by four places, earning specific recognition for its commitment to excellence and quality in the IT workplace. "At CSX, we believe that people make the difference," said Kathleen Brandt, president of CSX Technology. 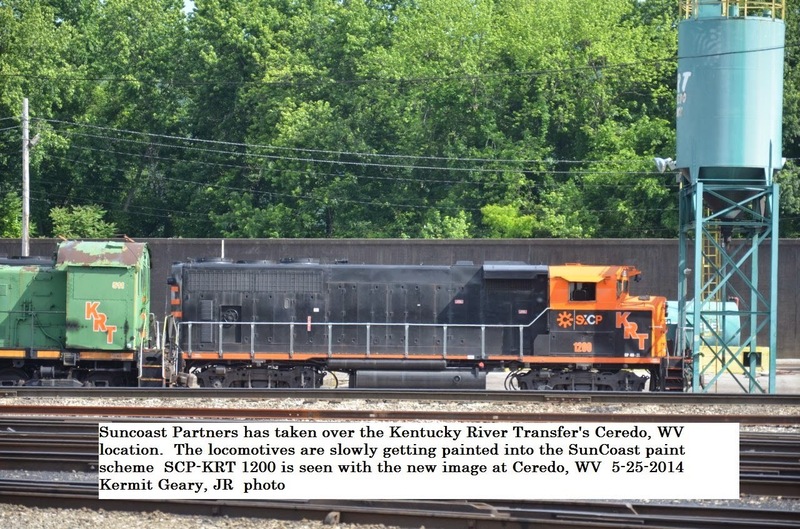 "The CSX Technology team supports the company's business goals by creating progressive technology solutions. Our continued success is built on an engaged workforce and each employee's dedication to providing reliable information and technology solutions and excellent customer service." "Hiring the best and the brightest IT pros, offering them competitive pay and providing top-notch benefits is just the beginning for the outstanding employers on this year's Best Places to Work in IT list," said Scot Finnie, editor in chief of Computerworld. "Both newcomers to the list and rock-steady stalwarts nurture their talent with challenging business-critical projects, extensive training opportunities and ongoing career development programs." The "Best Places to Work in IT" feature appears in the June 23rd issue of Computerworld and online at www.computerworld.com. JACKSONVILLE, Fla. - June 23, 2014 - CSX Corporation (NYSE: CSX) today unveiled its Corporate Social Responsibility (CSR) Report, showing continued progress in 2013 on the company's safety, environmental and community engagement initiatives. The full report - accessible on www.CSXCSR.com - details the company's financial performance and offers a comprehensive look at the markets CSX serves as well as progress related to sustainability, governance, corporate citizenship, and other initiatives. "Corporate Social Responsibility is at the core of CSX's identity and helps drive our business success," said Michael J. Ward, chairman, president and chief executive officer. 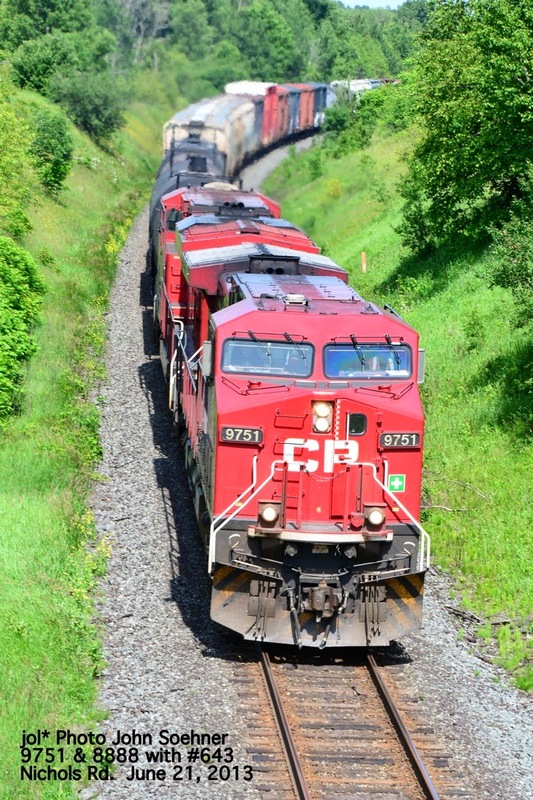 "Our CSR performance is fundamental to our vision to be the safest, most progressive North American railroad, relentless in the pursuit of customer and employee excellence. This report reflects our commitment to maintain transparency and accountability to our customers, employees, shareholders and the communities we serve." - Partnered with national and local organizations, including City Year, Future Farmers of America, American Red Cross, Alliance for Community Trees, Action For Healthy Kids, The Nature Conservancy, National Safe Place and Dignity U Wear. - Invested $2.3 billion back into its 21,000 mile network toward maintaining and improving its existing infrastructure and to position itself for long-term growth through expanding network and terminal capacity. CSX's 2013 CSR report was prepared in accordance with the Global Reporting Initiative (GRI) G4 Sustainability Reporting Guidelines. GRI is a globally recognized reporting framework for environmental, social and governance performance. The content and direction of the report was informed, in part, by the issues considered most material to the company's stakeholders including employees, customers, investors, community and NGO partners, regulators and suppliers. Spent most of the day on Saturday (6-21-14) masking and preparing the CR 21165 for its final coat of black trim. It rolled out of the shop that evening in FULL dress blue, White lettering, and Black trim. Brian Alesin set up his flash units and a number of us took turns photographing it in its new REGAL paint scheme. 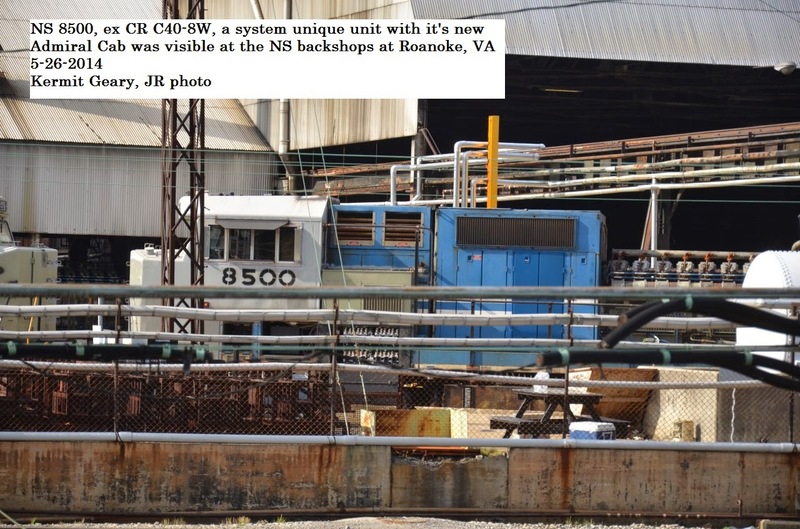 The car and the freight cars in front are owned by the CRHS. Received the following via email. It appeared as a posting to CRRNJ on yahoogroups.com. The Land Conservancy of New Jersey held its third annual "Pedal for Preservation" bike ride on the Columbia Trail today. With beautiful weather, over 305 cyclists participated. The Califon station museum wasn't open, and there's no NJT service to High Bridge today, but the former High Bridge Branch was busy with cyclists, dog-walkers, hikers, and equestrians. ...to be trackside for this colorful lashup on Sunday morning along CSX's Trenton Line (TL) in Manville, NJ. Via the Internet, I saw where there was a train of empty tank cars coming north on the TL making their way back to the midwest to transport another load of oil east. What made this train unique was the motive power. CREX 1214 (GE ES44AC) and CREX 6005 (EMD SD60; ex-SOO 6005) made for a very colorful duo as it passed by my location at TL MP 56. From a historical prespective, this was where Manville's former Reading station was once located. During the Conrail era, this track location was referred to as CP WESTON. JACKSONVILLE, Fla. - June 19, 2014 - The Association of American Railroads (AAR) bestowed its highest environmental honor, the John H. Chafee Environmental Excellence Award, on CSX's Chris Durden last night at a ceremony in Washington, D.C. The annual award recognizes railroad employees for outstanding environmental awareness and responsibility. Durden is the eighth CSX employee and first-ever intermodal representative to win the award, which is named for the late Rhode Island senator who devoted his career to protecting the environment. Sen. Barbara Mikulski also was honored with the 2014 John H. Chafee Congressional Environmental Award, recognizing her decades of leadership on environmental issues in her home state of Maryland, where she has led efforts to protect the Chesapeake Bay by restoring water quality, habitats and fisheries. 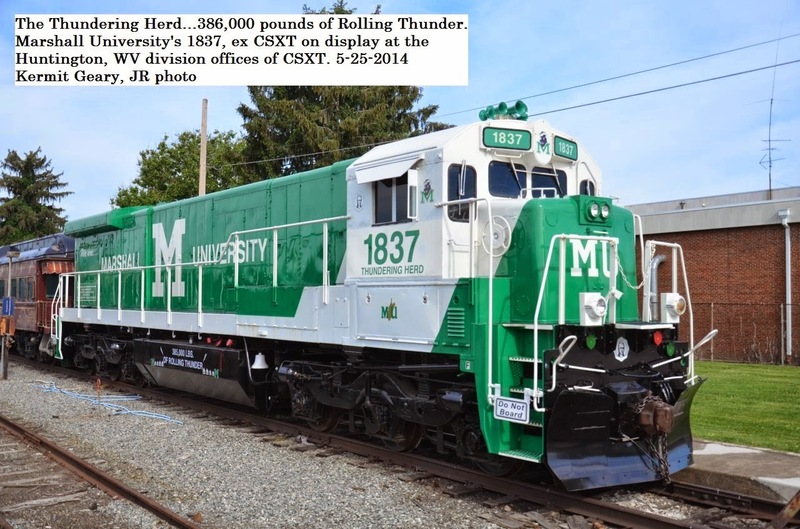 "Chris Durden leads a team that brings a unique understanding of the value of sustainable development for improving efficiency when building state-of-the-art intermodal facilities," said Wilby Whitt, president, CSX Intermodal Terminals. "Chris's commitment to further raising environmental awareness and including sustainability features within building design has contributed to CSX's success, and this award is a testament to his dedication." As the leader of CSX Intermodal Terminals' team overseeing terminal planning, engineering and construction, Durden has successfully orchestrated the completion of intermodal rail terminals across the CSX network, including the award-winning Northwest Ohio Intermodal Facility and terminals in Central Florida and Massachusetts. Durden's team maintains superior performance with a focus on the company's responsibility to the surrounding community, environment and wildlife. His teams implement industry-leading design features that combine operational efficiency with environmental responsibility, including electric wide-span cranes that operate with zero air emissions and regenerate 60 percent of their power back to the terminal electric grid; driveway and parking surfaces that reduce the heat island effect and stormwater runoff; solar photovoltaic panels that provide energy to buildings; and LED high-mast light towers that reduce energy consumption and maintenance costs. "Senator Mikulski and Chris Durden both embody the dedication necessary to ensure our environment is preserved and protected for generations to come," said Edward R. Hamberger, president and CEO, Association of American Railroads. "Chris's achievements showcase what is possible when railroad professionals make sustainability a top priority. 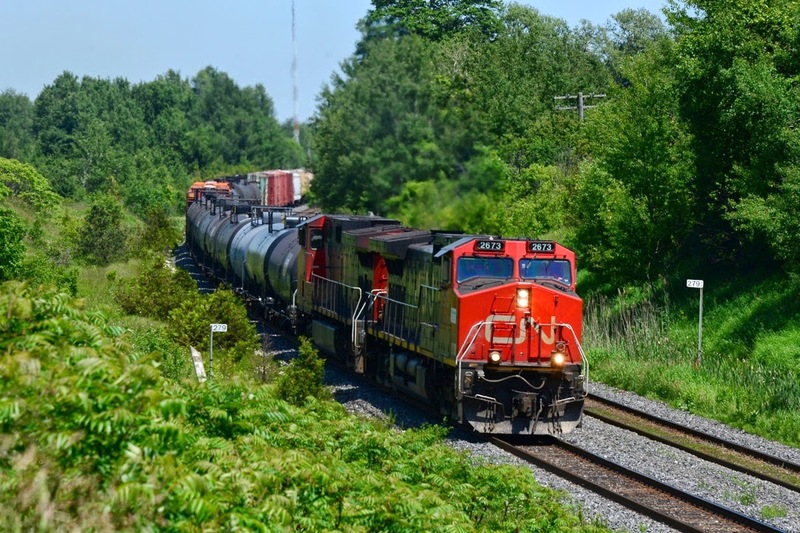 He consistently leads teams that find new ways to reduce environmental impact and improve the quality of life in communities served by the freight rail network. We are pleased to recognize him with the John H. Chafee Award, and appreciate his contributions." Durden's performance showcases CSX's commitment to sustainability, which affects every decision the company makes. CSX has invested $1.75 billion in fuel-efficient locomotives and technologies over the last decade, and is making strides towards its voluntary goal to further reduce greenhouse gas emissions by 6 to 8 percent by 2020. Through transportation solutions such as intermodal shipping, CSX is helping customers reduce costs, fuel consumption, highway congestion and carbon emissions. 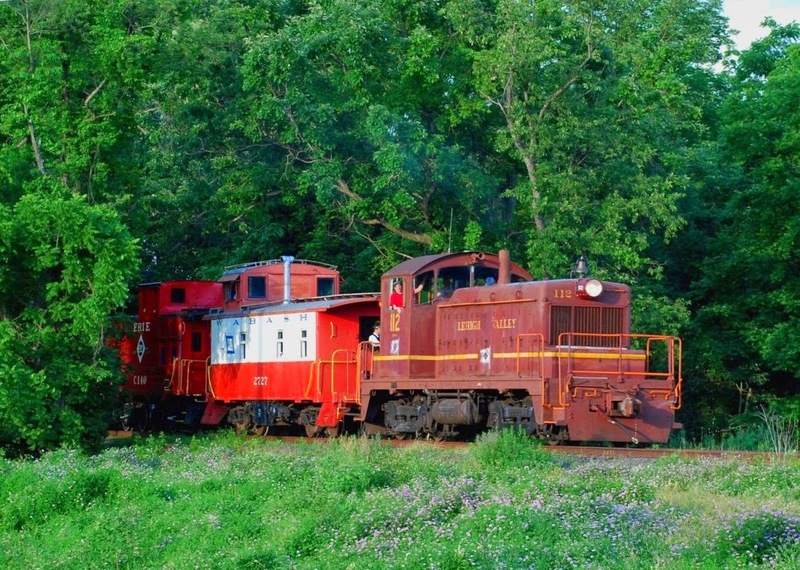 Black River & Western's first caboose hop of the season! 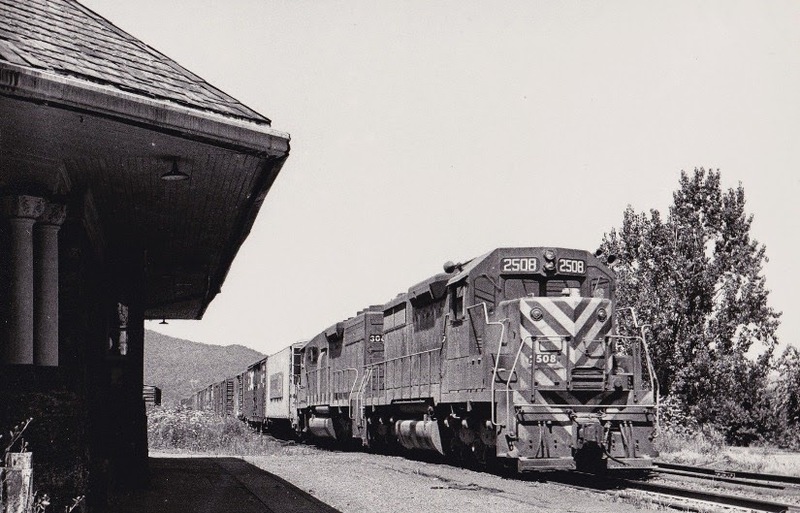 Saturday's excursion from Ringoes (NJ) to Three Bridges was advertised as having BR&W's #60 as the motive power to kick off the first of five caboose hops. Alas, #60 had a mechanical problem and that meant LV 112 would serve as the substitute power on this first excursion of the season. LV 112 is seen approaching the Foster Lane grade crossing with a Wabash, Erie, B&O cabooses and the John L. Bishop Club Car as its consist. JACKSONVILLE, Fla., (June 18, 2014) - CSX Corporation (NYSE: CSX) will release second-quarter financial and operating results on Tuesday, July 15, 2014, after the market close. The company will host an earnings conference call at 8:30 a.m. Eastern Time on Wednesday, July 16, 2014 via teleconference and a live audio webcast. 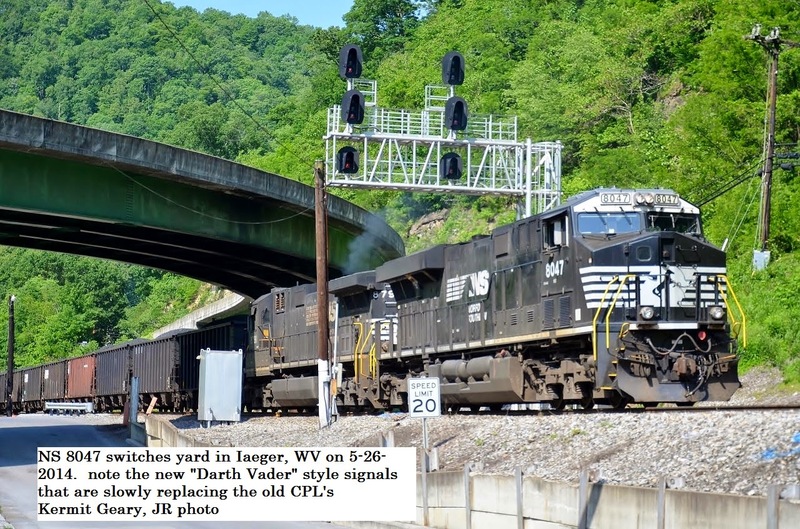 HARRISBURG, PA. - Norfolk Southern and Operation Lifesaver are bringing their Whistle-Stop safety train tour to Delaware and eastern and central Pennsylvania to stress the importance of public safety around railroad tracks. 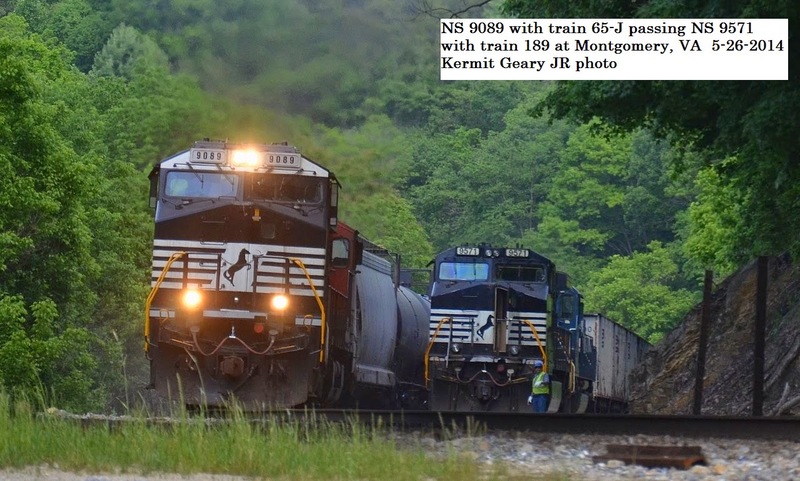 The Keystone Whistle-Stop Safety Train starts in Delaware on Monday, June 23, and by Thursday, June 26, the train will have transited through communities such as Harrington, Dover, Newark, Pottstown, Reading, Lebanon, Harrisburg, Lewistown, Altoona, and Latrobe. Since January 2011, Delaware has experienced 17 train vs. vehicle incidents at highway-rail grade crossings, and one pedestrian has been struck. Over the same period, Pennsylvania has experienced 185 train vs. vehicle incidents. Between January and March 2014 alone, 21 incidents have occurred, compared with 9 during the same period in 2013. 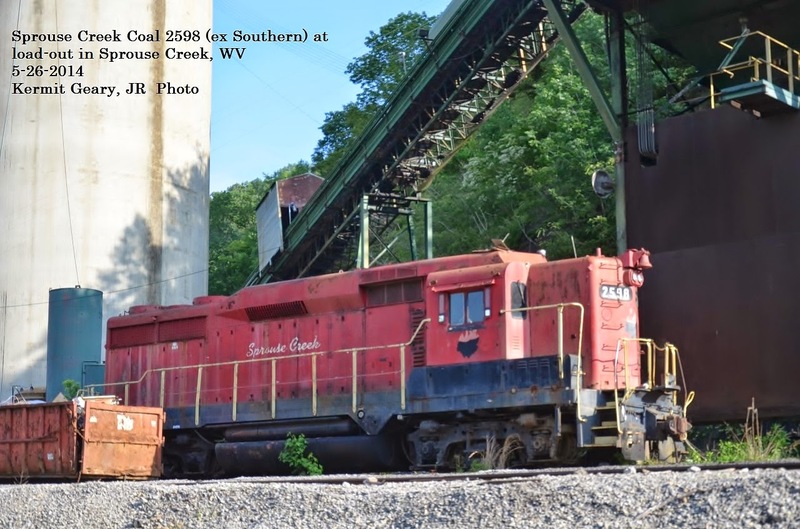 During this decade in Pennsylvania, 108 people have died while trespassing on railroad property and another 102 were injured. 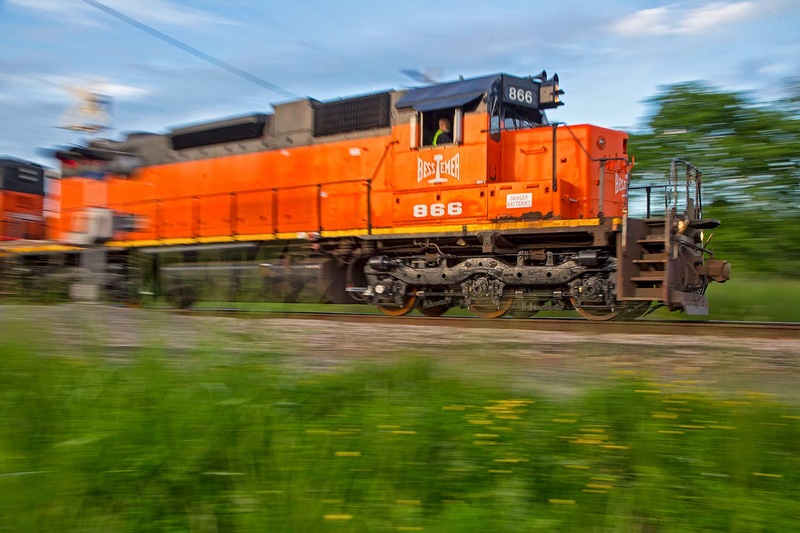 "There is no more important time than now for public safety officials and entire communities to learn how people can stay safe and alive around railroad tracks and other property," said Cayela Wimberly, NS' grade crossing safety director. 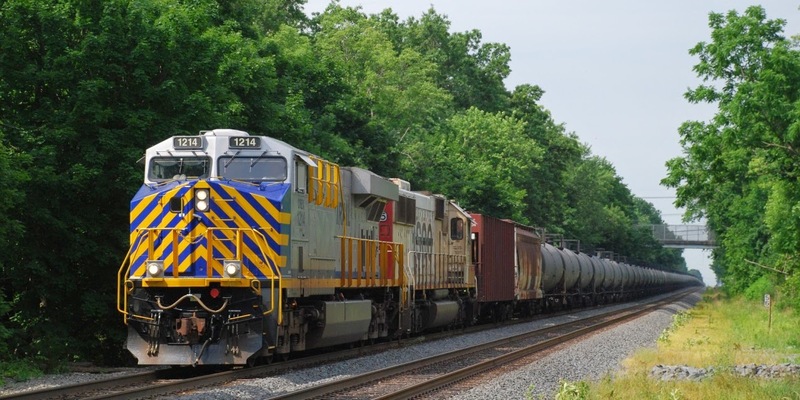 "We need a strong partnership between the railroad companies and the communities to keep the public safe near railroad tracks, bridges, yards, and grade crossings," added Thomas Algatt, state coordinator for Operation Lifesaver in Pennsylvania. 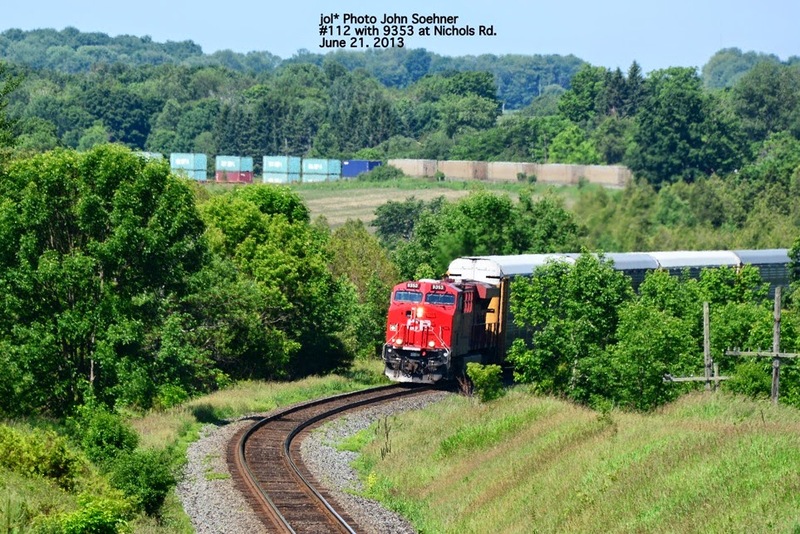 "We need parents, educators, neighbors, railfans, and friends to spread the word - stay away from tracks, stay away from trains, stay safe, and stay alive. And we're going to talk on the Keystone Whistle-Stop Safety Train about how you can have that conversation with the people you care about." 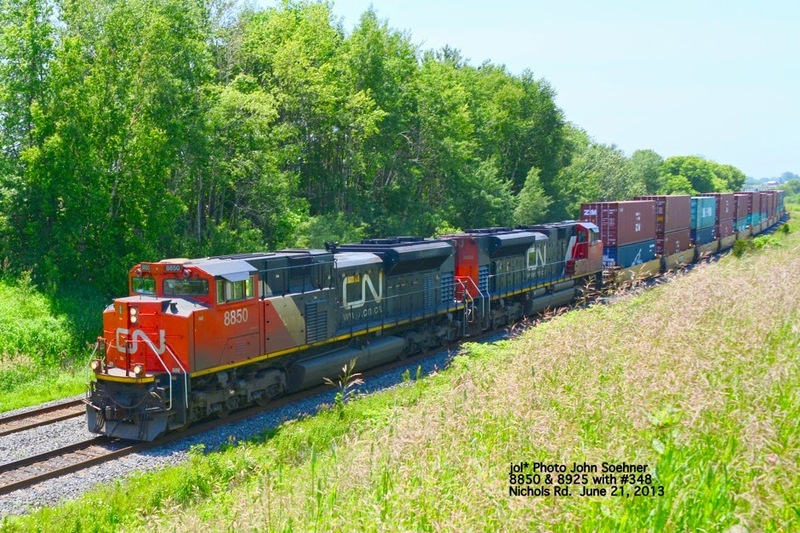 The train includes two NS locomotives with the Operation Lifesaver logo displayed on their flanks, two vintage passenger cars, the NS Exhibit Car, and the NS Research and Test car. Passengers will include railroaders, Operation Lifesaver representatives, public safety advocates, and news media, all of who will observe via live video the train crew's point-of-view as the train moves on the track and approaches grade crossings. 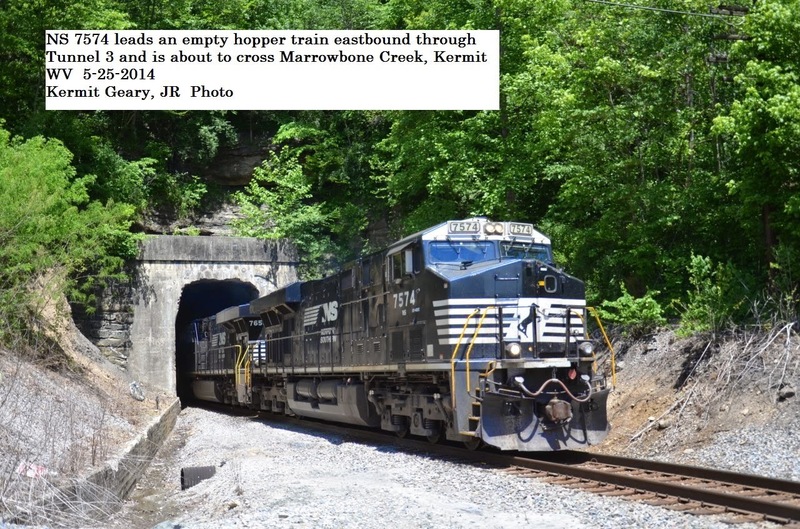 It's the third such trip this year for Norfolk Southern and Operation Lifesaver on the NS network. A fourth trip is scheduled in Indiana, Illinois, and Missouri later this summer. Operation Lifesaver (www.oli.org) is a national nonprofit safety organization whose mission is to end collisions, deaths, and injuries at highway-rail grade crossings and along railroad rights of way. Not many photographs are taken of NJT’s current Annandale “station” at RVL MP 50.4 since all that exists is a nondescript small shelter! The original station was designed by Bradford L.Gilbert and built between 1889 and 1900. That station would fall victim to a fire which burned it down in 1934.The replacement station was a modular unit brought in by train and assembled by 1935. That station would last until 1983 when it was razed. Currently the seventy-seven car NJT parking lot here has eradicated any traces of the structure that once stood here. NJT Train 5176 is seen here on May 30, 2014 as it heads east. When would the track in the foreground be used? During my trips here, I cannot recall seeing a train use that track. Regarding the track in the foreground, your blogger's sources inform us that it is part of a controlled siding from MP 52.1 (High Bridge/Arch) to MP 49.7 (Clinton) with the Annandale station at MP 50.4. This siding is used for passing of "live" trains and dead-head moves, although I suspect the actual passing is not done in the station. NJT's RVL: Next stop is White House Station! 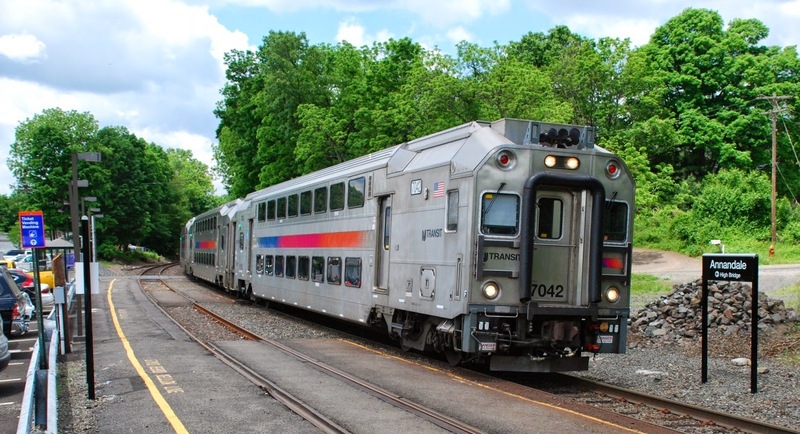 White House Station is located on NJT's (New Jersey Transit) Raritan Valley Line (RVL) at MP 44.2. On August 5th, 1972, CNJ freight BJ-4 is east bound and approaching the Main Street grade crossing in town. Judging from what can be seen of the station, it certainly seems to have seen better days! Fast forward to May 30. 2014 when NJT's 5170 is making a scheduled station stop before continuing its "one-seat" trip into New York at 9:32. Seven passengers would be boarding here. The White House Station seems a far cry from when the CNJ was traveling these rails. A plaque on the station's wall facing the track gives a brief history about this station. It states "...the CNJ, also enjoying a period of prosperity, commissioned noted architect Bradford L. Gilbert to design a new station. Gilbert chose a popular Victorian style, Richardson Romanesque, which is characterized by a heavy, rough-cut stone exterior, broad roof planes, deeply recessed arched window and door openings and the use of a variety of shapes and forms, such as a polygonal porch on the front of the building. 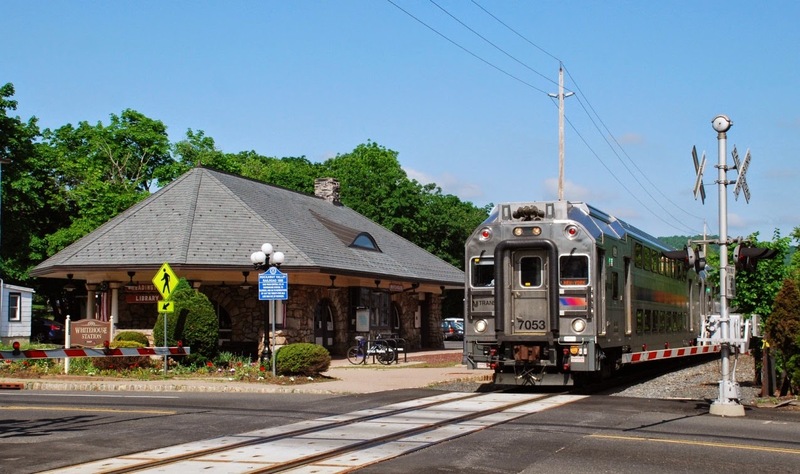 Through citizen initiative and the New Jersey Transit Leasing Station Program, the station was restored to its original grandeur. On December 7, 1981, after seven months of dedicated community effort, White House Station opened its doors as Readington Township's first public library. White House Station was listed on both the State and National Registers of Historic Places in 1984." The library has a framed copy of a local newspaper's article telling the story of the station that makes for interesting reading. There are also some black and white photographs of the station and CNJ steam engines. Walking around the building, there is also a US Coast & Geodetic Survey Benchmark inserted into the building's stone wall. 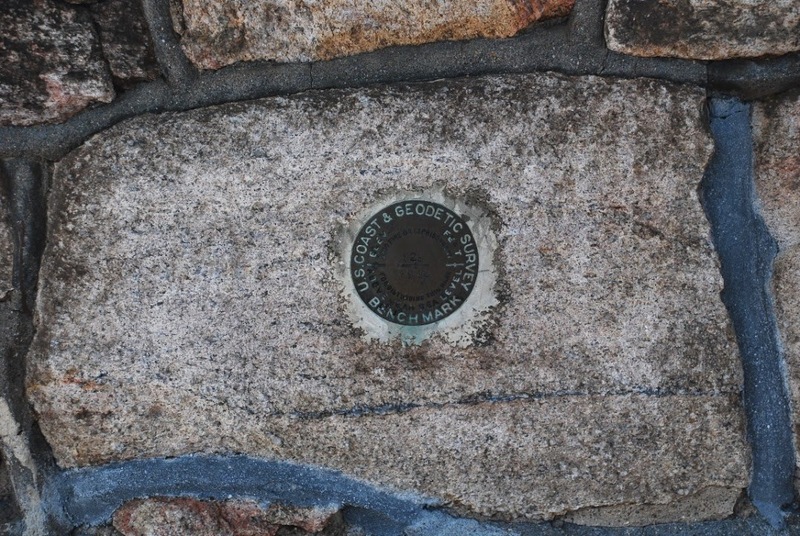 A benchmark is generally applied to any item used to mark a point as an elevation reference. I consider this rather unique since this is the first benchmark I have seen embedded in a building's wall. JOIN THE WOODLAND TOWNSHIP HISTORICAL SOCIETY, CHATSWORTH, NJ IN A TOWN WIDE EVENT. For your donation of $5.00 you will receive a blue rubber wristband "The Blue Comet". Your day begins at the White Horse Inn, 3980 County Rd. 563, Main Street, Chatsworth, NJ 08019. Displays, a self guided tour, speakers and lunch are all within walking distance. Parking will be in the field across from White Horse Inn. Coffee and snacks for morning break, as well as lunch, will be available at the firehouse, which will be serving some items from the Blue Comet’s menu. Hot Diggity Dog serves refreshments outside on Main Street and Buzby's Chatsworth General Store is open for Pinelands gifts. A collectible coin will also be available for purchase throughout the day. Just a reminder of the Hobo Beans and Diesel Dawgs Summer Solstice at Nichols Road, Newtonville Road area. That's June 21, 2014! 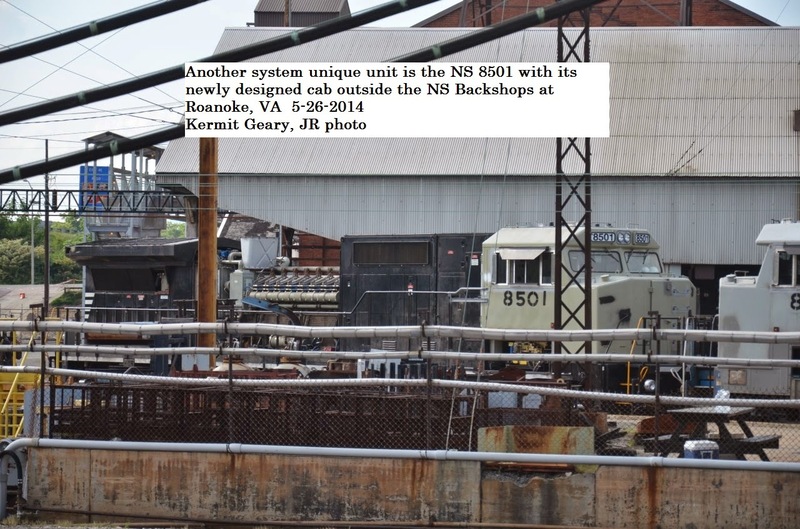 More info on this project in Washington, DC, following the CSX announcement. 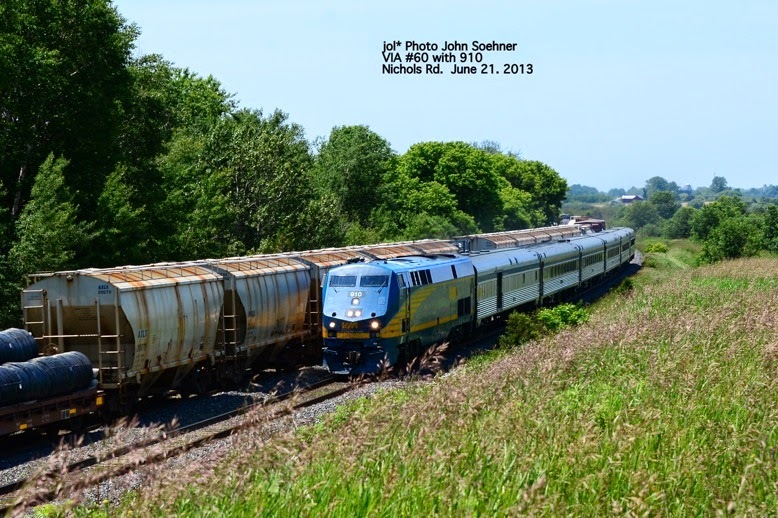 JACKSONVILLE, Fla. - June 13, 2014 - CSX applauds the Federal Highway Administration (FHWA) and the District Department of Transportation (DDOT) for advancing the reconstruction of CSX's Virginia Avenue Tunnel in a way that responds to community concerns in the project's design and construction plan. The Final Environmental Impact Statement (FEIS) issued today by FHWA and DDOT identifies the preferred alternative for construction, "Alternative 3 - Two New Tunnels." Specific details of the alternative are available via a FHWA/DDOT fact sheet at www.virginiaavenuetunnel.com. 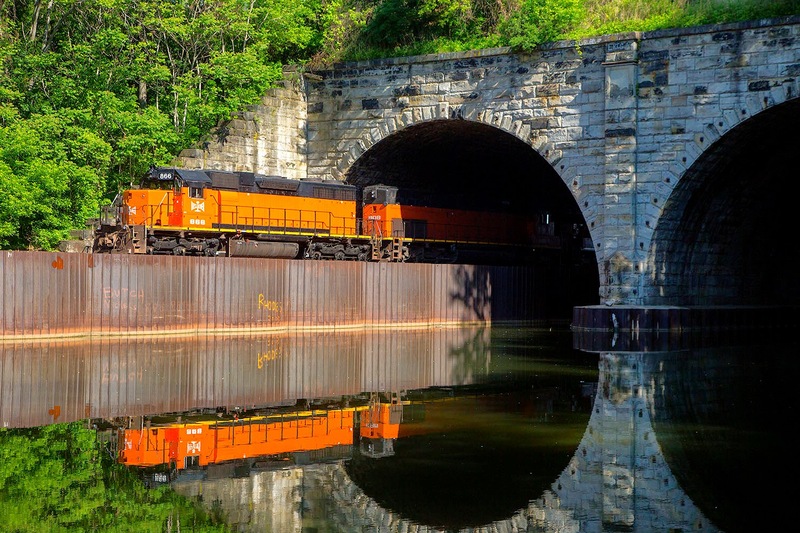 CSX is proposing to spend hundreds of millions of company dollars to reconstruct this 110-year old tunnel, to move people and goods more efficiently for the benefit of commuters and businesses in the District and throughout the region. The release of the FEIS is a critical step forward to modernize the country's aging infrastructure in a way that promotes the safety and well-being of local neighbors. "The preferred alternative is the direct result of years of community input during the environmental review process. It addresses community concerns and prioritizes neighborhood safety and security during construction. Under this plan, construction is expected to take approximately 30 to 42 months and trains will run in an enclosed tunnel in front of residences," said Louis Renjel, vice president, strategic infrastructure initiatives. "Today's announcement means CSX and the Virginia Avenue community can focus our ongoing discussions on a single potential construction plan, discuss the potential impacts of that plan, and share information about the many things CSX would do to minimize those impacts." CSX's efforts to minimize the impact of construction would include actions that would be naturally a part of the construction plan; additional actions CSX would take during construction to minimize impacts; and actions CSX would take after construction to help enhance the Virginia Avenue neighborhood. 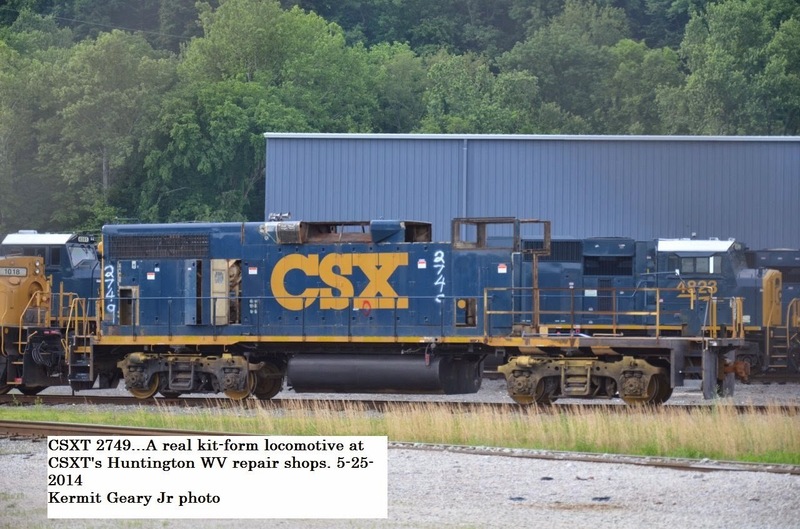 "CSX has a strong track record of working in a way that respects our neighbors. We look forward to continuing to talk with the Virginia Avenue community and public officials as we fulfill our commitments: to make safety our top priority during and after construction; to minimize the impacts of construction on local residents and businesses; and to collaborate with the community on enhancements that help make a great neighborhood even better," said Renjel. * Providing compensation to the residents who are impacted the most - the residents directly next to the project - and to Virginia Avenue Tunnel neighborhood organizations, to minimize construction impacts as the residents and organizations choose. * Installing landscaping and improved street lighting, traffic signals and crosswalks. The FEIS is available for review for 30 days before an official decision is released, and can be downloaded from www.virginiaavenuetunnel.com. A public meeting will also be held on July 1, 2014, at the Capitol Skyline Hotel, 10 Eye Street SW, Washington, DC 20024. The meeting will include a presentation on the details about construction and will include a brief time to ask questions of the project team. 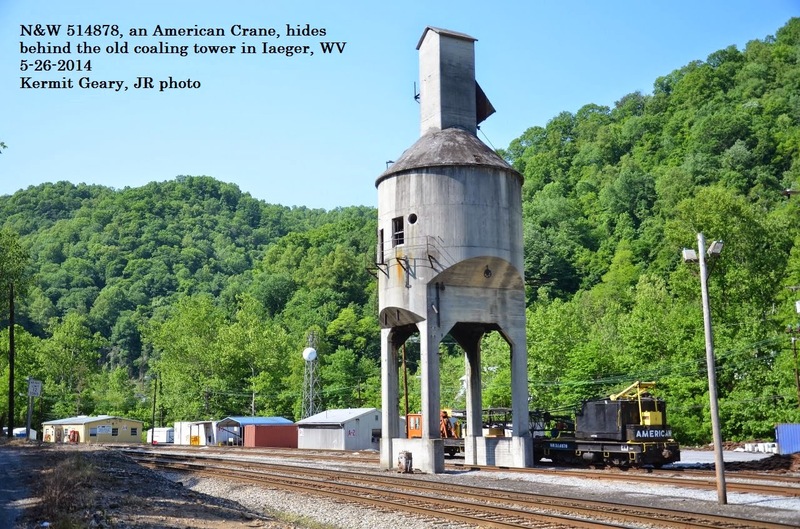 Here is a brief description of this project taken from http://www.virginiaavenuetunnel.com/project-area/ , which also has a couple of pictures of the project area. The Virginia Avenue Tunnel is located immediately beneath Virginia Avenue in southeast DC for approximately 4,000 feet and contains a single track. The tunnel is bound by 2nd Street SE near the southern portal and 11th Street SE near the northern portal. The south portal portion of the work will join with the New Jersey Avenue Track Lowering project. From the start of construction, current estimates predict that the project will take three years to complete from the start of construction work. In addition to re-installing the second track, the height of the tunnel roof will be raised to allow for double-stack intermodal container trains. Also, there may be some lowering of the tracks as part of this project. However due to rail grade, potential water intrusion, close proximity to the Anacostia River and challenges with sewer lines that run under this area, there is a very limited distance that the tracks can be lowered. This project may necessitate the temporary closure of a section of Virginia Avenue while the construction is underway; however, all cross streets will be open for the majority of the project to ensure the least amount of disturbance to local residents. Additionally, these improvements to the Virginia Avenue Tunnel will reduce air pollution and improve the overall quality of life for residents. 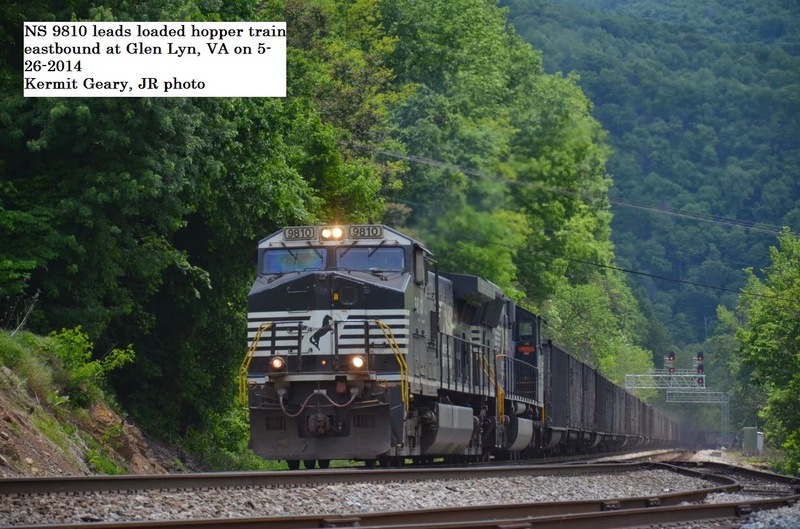 Received the following via email from the Black River & Western Railroad, Ringoes, NJ. Club Car Seating Now Available! 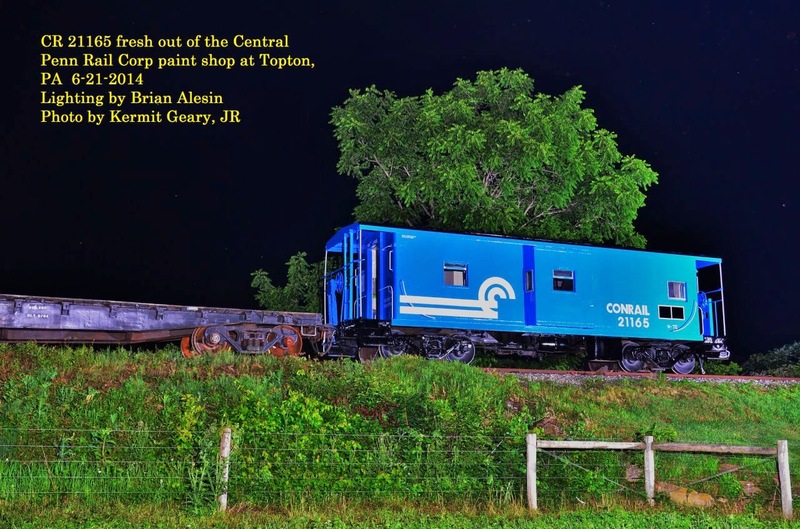 In order to accommodate extra passengers we have added our club car, the "John L Bishop" to the June 21 Caboose Hop. 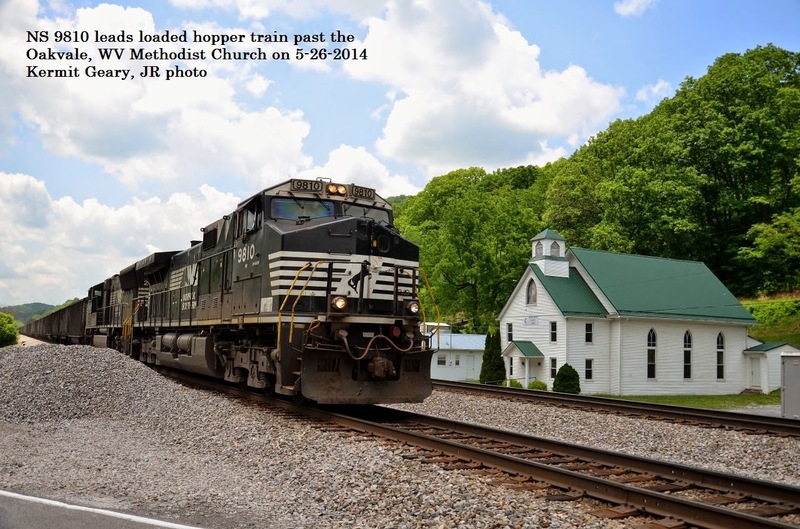 This train will travel from Ringoes Station to Three Bridges and back, and will be pulled by steam locomotive #60! Departure time from Ringoes is 5:30 PM this Saturday and reservations are required. Tickets are $15 per passenger age 3 and up. Kids under 3 are free and do not need a ticket. Seats are selling fast - don't miss this chance! 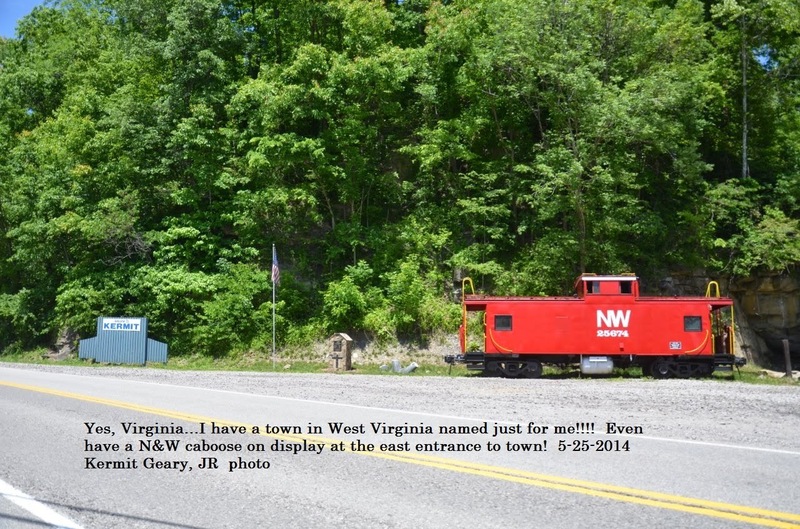 Saturday June 21, 2014 Ride in our club car, the "John L Bishop" all the way from Ringoes to Three Bridges and back! Reservations required. 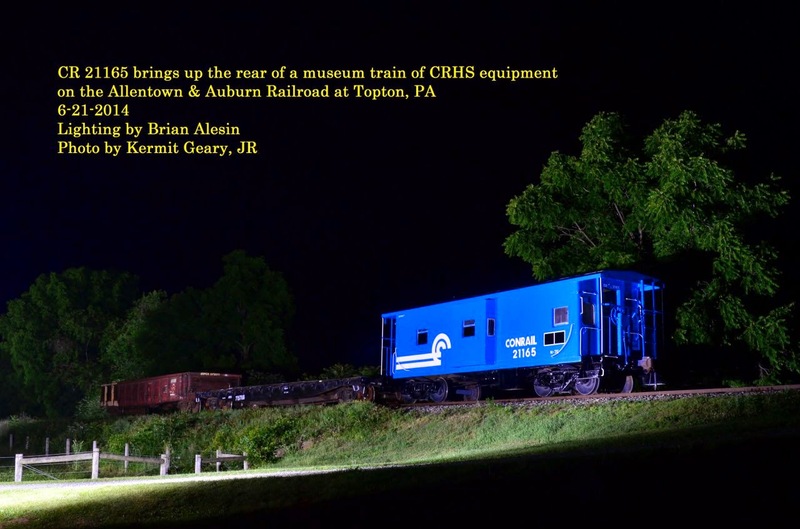 Your car will be attached to the "Caboose Hop" train departing Ringoes at 5:30 PM. 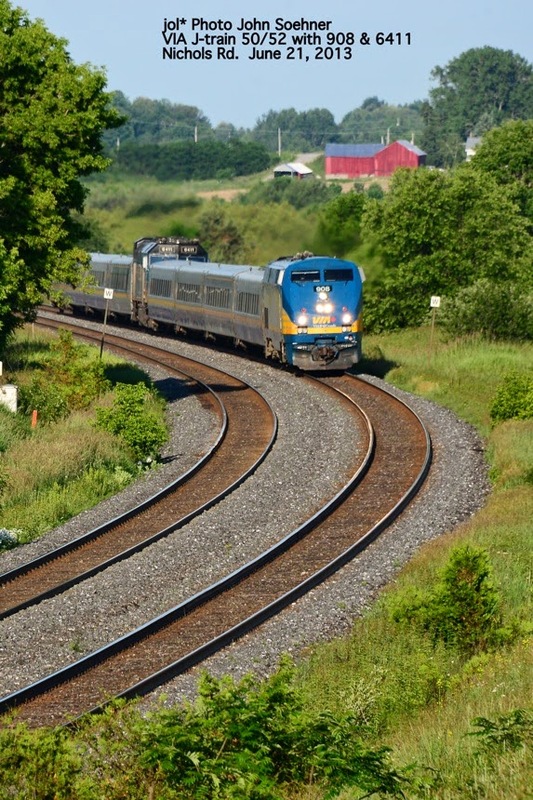 Enjoy a round-trip excursion between Flemington and Ringoes, and the Conductor will narrate a popular children's book. Kids can follow along with their own copy of the book! Reservations required. "A" tickets are Adult tickets (age 12+). "C" tickets are Child tickets (under age 12). Make sure you consider how many books you want when choosing which tickets to purchase. Only tickets that indicate "1 book" in their description include a book! and headed to Oakvale, WV and shot it passing the Methodist Church there. two system unique units 8500 & 8501 sitting outside. Thomas Talks! Visiting Phillipsburg this July! Thomas Talks for the very first time! Thomas The Tank EngineT to visit July 11,12,13,18,19,20 and will speak directly to fans in Phillipsburg for the very first time! Children will get the thrill of their lives when Thomas the Tank EngineT steams across the country this year. When Thomas arrives at Phillipsburg for the Day Out with ThomasT: The Thrill of the Ride Tour 2014, he will not only take his fans for a ride, but also talk to them for the very first time on the tour! 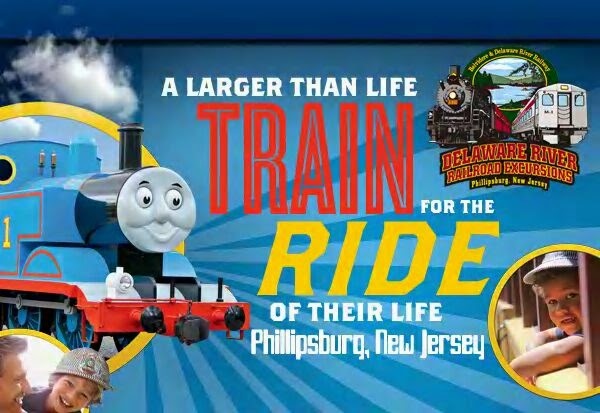 The event, which takes place July 11,12,13 18.19 20, 2014, will be hosted by The Delaware River Railroad Excursions and presented by HIT Entertainment and sponsored by MEGA Brands, a leading toy company, and all inclusive Hard Rock Hotels. Day Out with Thomas: The Thrill of the Ride Tour 2014 is a fun-filled event that provides children of all ages the opportunity to climb aboard and take a ride with Thomas as well as participate in Thomas & Friends themed activities. The tour, now in its 19th year, will make stops in 42 U.S. cities and is expected to welcome nearly one million passengers in 2014. For 2 back-to-back weekends, little engineers and their families are invited to take a 25 minute ride on their favorite engine, meet Sir Topham Hatt®, Controller of the Railway and enjoy a day of Thomas & Friends themed activities including arts & crafts, storytelling and more. 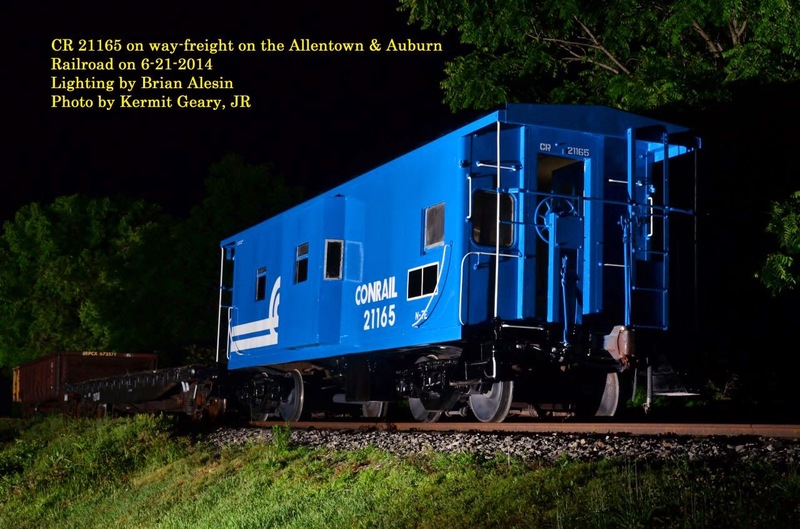 The Delaware River Railroad Excursions will also offer great family themed entertainment and musical acts all day long. Thomas the Tank Engine rides depart every hour, rain or shine. Departure times begin at 10 am through 5 pm each day of the event. Tickets for the Day Out With Thomas: The Thrill of the Ride Tour2014 are $20.00 plus tax for ages two and up. The New York Susquehanna & Western Technical & Historical Society Inc. was formed in the fall of 1988 by several longtime observers of the railroad who felt that there was a need for an organization to preserve the history of the "Susquehanna, its ancestor corporations and the rich railroading history of New Jersey. Since that time, the Society has grown to over 550 members from 30 states, Canada and New Zealand. The society is incorporated in the state of New Jersey as a non-profit educational organization. It is also recognized by the Internal Revenue Service as a tax-exempt organization, as defined in section 501 (c) (3) of the Internal Revenue Code. The society operates the Delaware River Railroad Excursion home of New Jersey's only operating Steam Locomotive. The Delaware River Railroad Excursions is run entirely by volunteers and is now in its 11th year of operation bringing close to 100,000 visitors a year to its beautiful grounds on the Delaware River in Phillipsburg, New Jersey. Half Price Tickets For Dad! In honor of train-loving Dads everywhere, we're offering half price tickets for our Summer Excursions on Father's Day to all Dads, with the purchase of at least one child's ticket. Trains depart Flemington at 11:30 AM, 1:00 PM, and 2:30 PM. You can also start your trip at Ringoes, with trains departing at 10:45 AM, 12:15 PM, 1:45 PM, and 3:15 PM. Stay tuned for information on our fall schedule! We'll soon be releasing details of this year's corn maze and pumpkin trains! See you at the railroad! 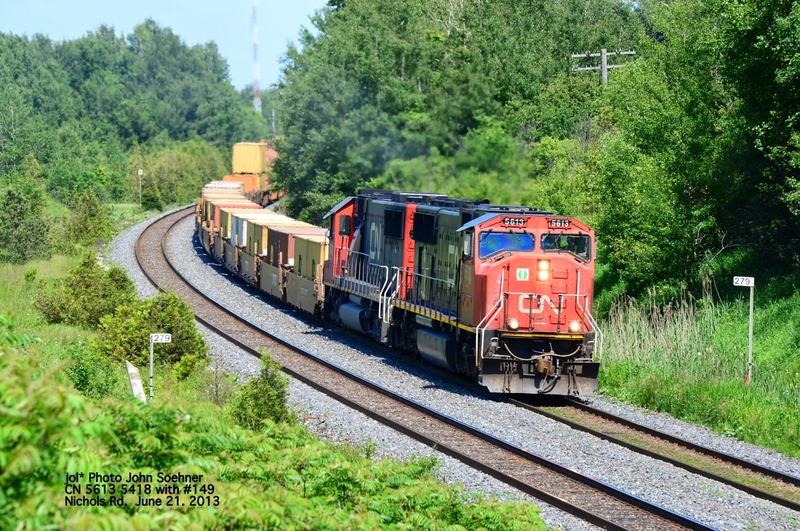 This morning (6-9-14), Brian Plant forwarded to me 26 fabulous pictures he took over this past weekend of operations on the Canadian National's Bessemer Subdivision in stunning light. His images were, as always, terrific photographs. I thought I'd forward along these three, in particular, since the full email has a really big attachment file and I am partial to former B&LE EMD SD38AC #866 in the lead. 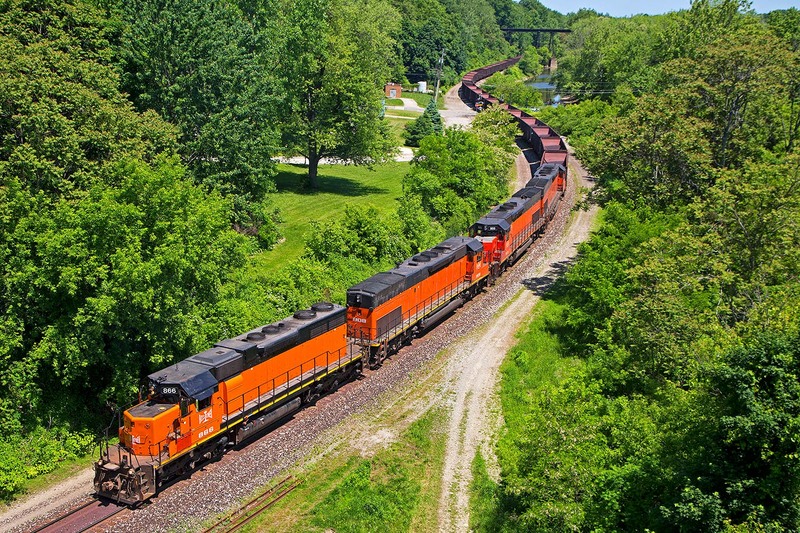 The first view of the ore train coming out of Conneaut Harbor, on the north coast of Ohio in Ashtabula County, shows 11,000 horsepower ganging up on a southbound unit train of Minnesota taconite pellets for the U.S. Steel Edgar Thomson Works at Irvin, PA. The train was snaking up out of the Lake Erie Basin along Conneaut Creek and was about to pass beneath the U.S. Route 20 viaduct. The second shot shows the 866, earlier, a little further north, as it exited the arches beneath the CSX Transportation Boston-St. Louis main line. The slack water where Conneaut Creek is stilled by reaching the level of Lake Erie at Conneaut Harbor calmly reflects the vibrant orange paint of the EMD as it begins the southward journey. I saved what I think is the best for last. If you've ever wondered what an ore train doing IndyCar speed would look like, I think this dramatic pan shot gives a pretty good clue! With its Gyralite beneath the horns hanging prominently out over the nose, as if to point the way, 866 flashes through KO, past a foreground blur of wild mustard and background trees. The train will soon roll out over the long Osgood Viaduct and climb up the grade toward Kelsey. 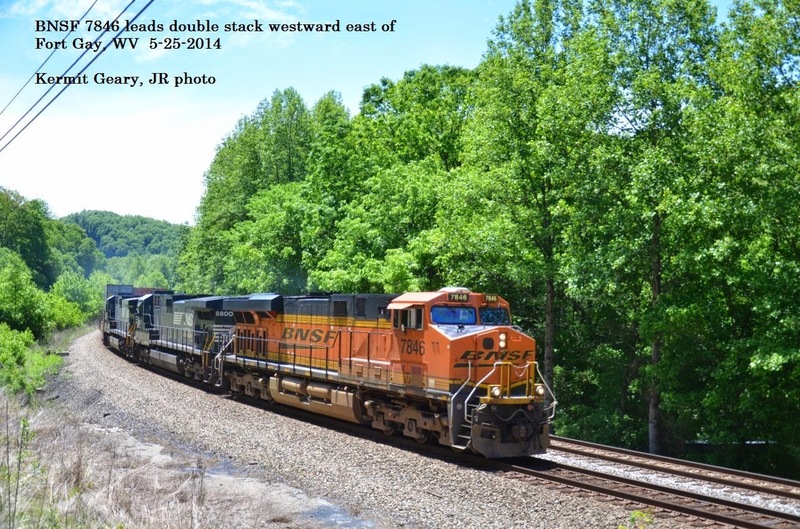 This is just one of the coolest shots from along The Bessemer Route that I've seen! Also see the first post in this series below dated Wednesday, 6-11-14. Dad's Ride Free Father's Day Weekend!